Core data and in particular special core analysis laboratory measurements are central to both static and dynamic reservoir evaluation. But the data are often sparse, poorly understood and incorrectly deployed. Q-SCAL is a database and set of analysis tools to allow you to maximise the integrity and value of your SCAL data. Q-SCAL’s internal database is a standard relational type, so most compliant 3rd party software should be able to access the data. There is also a seamless link to the Petris Recall™ system, so users of this industry standard database have instant access to all of Q-SCAL’s data and analysis tools. 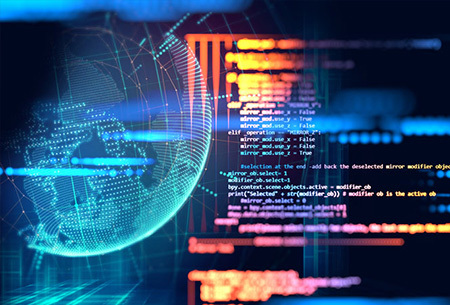 In today’s hectic industry, by no means the least important aspect of Q-SCAL is the speed at which data loading and analysis can be performed. Traditional two or three day jobs can now be done in hours, a huge saving in cost and time. Most core analysis data are presented in XL spreadsheets, and Q-SCAL reads directly from these. A set of templates distributed with the program describe many common formats; but you can also define your own. In this way, large quantities of often complicated data can be loaded in minutes. Conventional core data can be plotted and analysed in common and unconventional ways. Flow unit techniques (FZI, RQI etc.) allow powerful modern poro-perm relationship analysis. Data corrections include closure, stress, clay, equilibrium state and other adjustments, depending on the type of cap.pressure experiment. Quality control is an essential element of data preparation. 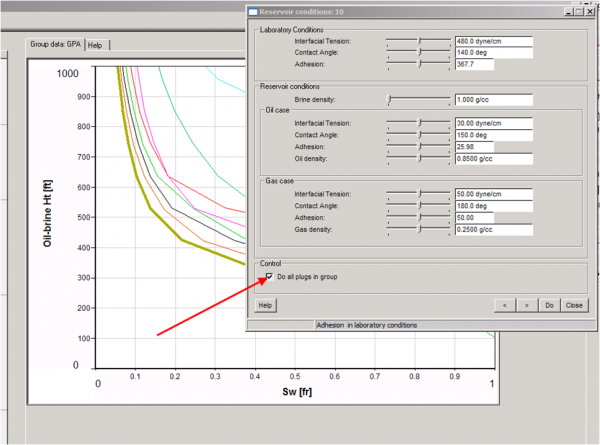 Conversion to reservoir conditions (saturation-height) is an interactive process where you can visually understand the influence of surface tension, contact angle and other reservoir variables, validating your decisions against supporting data. Estimation of residual saturations based on reservoir closure or other criteria. Typing of sample data by Lambda, Thomeer , Skelt-Harrison, J-Function and other common algorithms. Group fitting of field-, well- or lithology-based datasets on porosity or permeability criteria. Alternatively, you can search for relationships between saturation-height fitting parameters and other sample characteristics – porosity and permeability of course, but also grain density, lithology and so on. 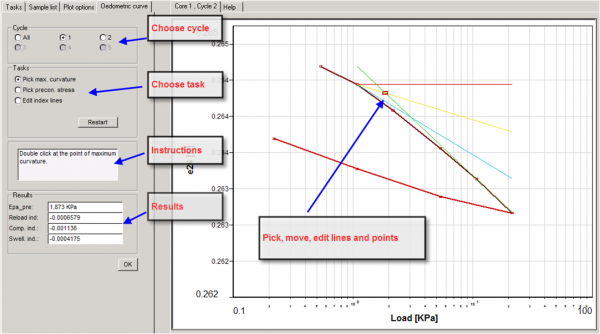 Generation of type curves by statistical or visual analysis of the data set allows you to optimize your saturation height functions, vital for hydrocarbon-in-place estimations and correct initialization of the dynamic model. A work flow similar to that of capillary pressure guides you through data corrections and quality control, curve typing (Corey and others) and data grouping. The same final goal also applies: increasing your understanding of the available data and its relationship to the study reservoir’s detail adds confidence to the dynamic model upon which so much of a company’s development strategy depends. Increasingly, NMR laboratory measurements are being run not only to help understand the wireline log (itself now becoming part of most standard logging suites) but also for the petrophysical insight they give of themselves. Q-SCAL allows you to load the raw time–amplitude data (XL or RiDat files) and invert the data yourself. Butler-Reeds-Dawson, Tikhonov and Maximum Entropy algorithms are implemented. Alternatively, you can load T2 or T1 data directly. Working with groups of data you can decide cut-off strategies for log calibration, or facies typing in conjunction with log or other SCAL data. The geomechanical applications have been developed in conjunction with ENI and Petris. Please call us for more information. Integration of different experiment types. One of the goals of Q-SCAL is to allow different test types to be grouped and analysed together. For example, comparison of NMR data (in part a pore size measurement) and capillary pressure (in part a pore throat measurement) can reveal relationships and flow models otherwise unavailable. Aggregating in this way, maximum value and confidence can be obtained from the often sparse SCAL data sets. Q-SCAL is under continuous development. Other tests will be added, and analysis techniques and workflows on existing techniques are under constant review and improvement.